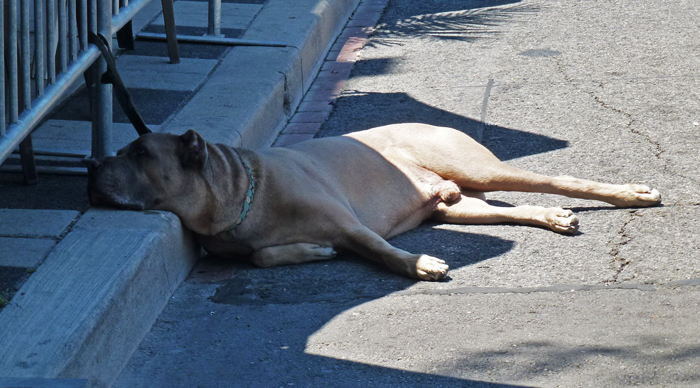 When I was at the Salsa On St Clair event a couple of weeks ago I spotted this large fellow having a rest along the curb and trying to get into the shade. His humans were sitting on a patio about a foot in front of his nose and he looked totally unaware of all of the activity around him until another dog walked by. He simply lifted his head checked out the competition and then plopped his head back down. A very mellow big guy! Its the time of year I guess. What a lovable big baby he is! Hello, he just barely fits into the shady spot. Cute doggie and photo. Thank you so much for linking up and sharing your post. Happy Saturday, enjoy your weekend! I love big dogs. They all tend to be mellow fellows. I saw one yesterday that got up to greet another dog, did the little sniff around and went back to his spot in the shade. That is a most relaxed dog, obviously keeping an eye on its people. Good shot. He's better behaved than some people and doesn't have the energy to be bothered by unimportant things. :) Great shot Pat. A dog this size can afford to be mellow! Now I realizing what they mean by "dog days of summer". Andy beat me to my first thought, "dog days of summer." Very cute capture. I'm glad his people were close by. Sometimes it's all just too much effort 😀 super shot Pat. If I had a dog, that’s the kind of personality I’d want it to have! Awe sweet pup, I'd be like hey pup how are you! Very mellow, what a good boy. I have never owned a dog that relaxed lol! I want to lug his hind quarters into the shade, too. He looks like he is sweltering.